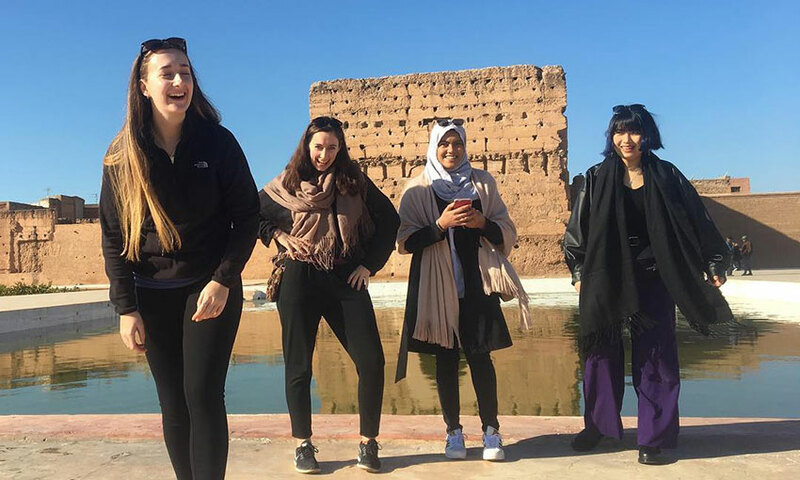 From visiting palaces to exploring through the mysterious souks, my visit to Marrakech with BA Textiles at Cardiff Met has been a sensory overload of spices, vibrant colours, traditional music and breath-taking sights. It has given me a cultural understanding I didn’t have before, and left me in awe of Morocco. The beautifully decorated Cafe Clock. 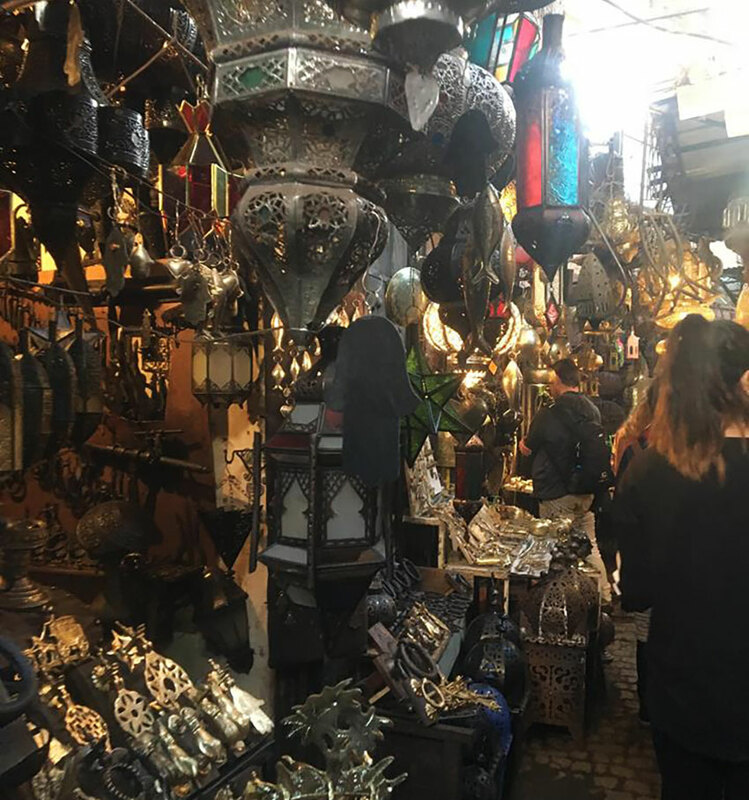 The morning of the first day was taken up with travelling but in the afternoon, we explored the areas surrounding the hotel with the densely populated and vibrant markets full of artisans and eye-catching designs. 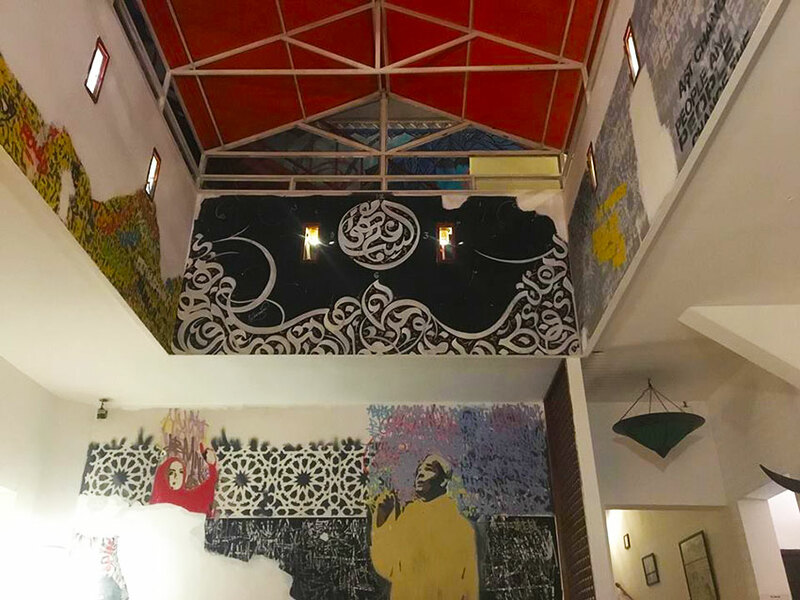 In the evening we went to Café Clock where there was traditional story telling and some intriguing dishes on the menu such as camel burgers and tagines. 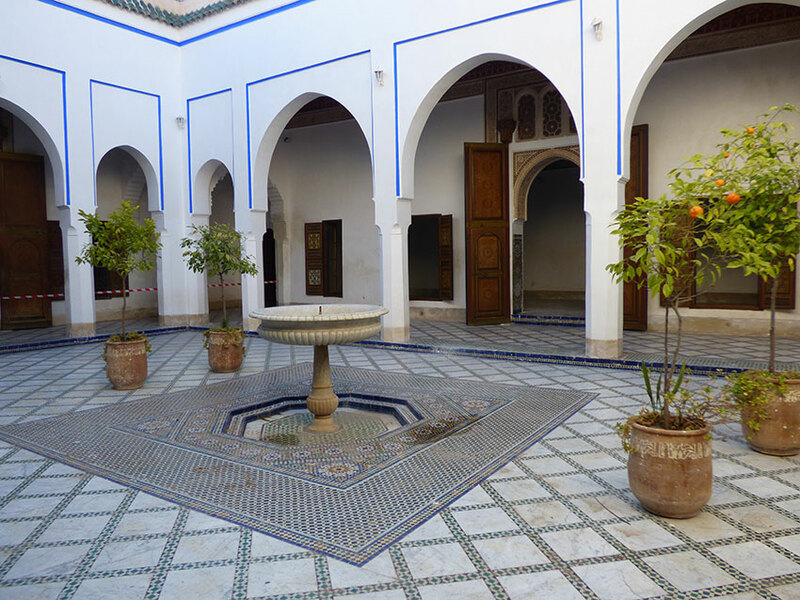 One of the most memorable trips was to Bahia Palace which demonstrates Islamic and Moroccan style. This guided tour gave us an insight to the history of the palace and its fascinating residents of the past. I was blown away by the various patterns, wood carvings and beautiful stain glass windows that fill this palace with light and colours. Everywhere I looked gave me inspiration for creating my own unique patterns. Visiting El Badi Palace was a huge contrast – it was a fascinating place to experience, but the grounds are now a ruin. Luckily, having been to Bahia Palace I was able to imagine how grand it would have been in the past -particularly the vast water features and garden areas. I felt this palace had an aura. There’s so much colour everywhere in Morocco! 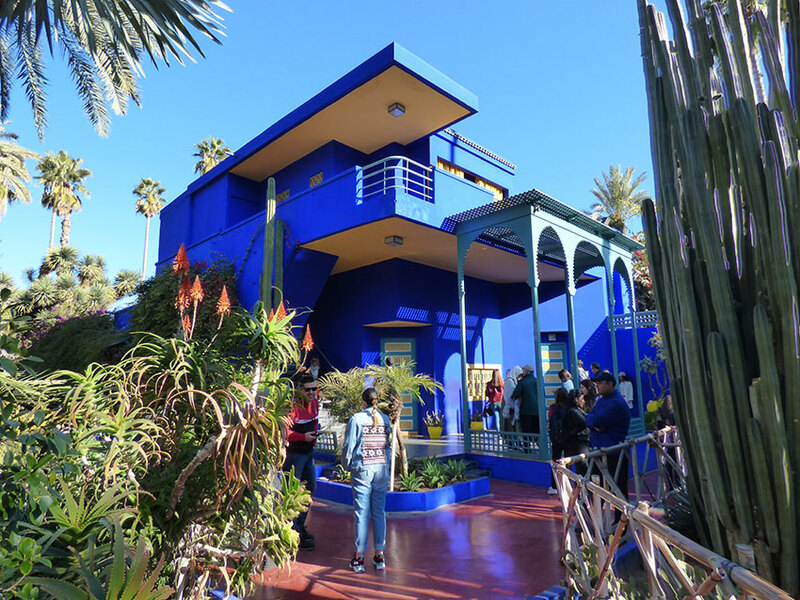 Visiting Majorelle Gardens was the perfect opportunity for me to gather research for my current project. The blue, orange and yellow paintwork surrounding a variety of cacti was appealing for me as a textile design student. I had my camera out the whole way around capturing the different colour and texture combinations. The bright paints were built up in layers on the pots to maintain the colour, creating a textured surface. 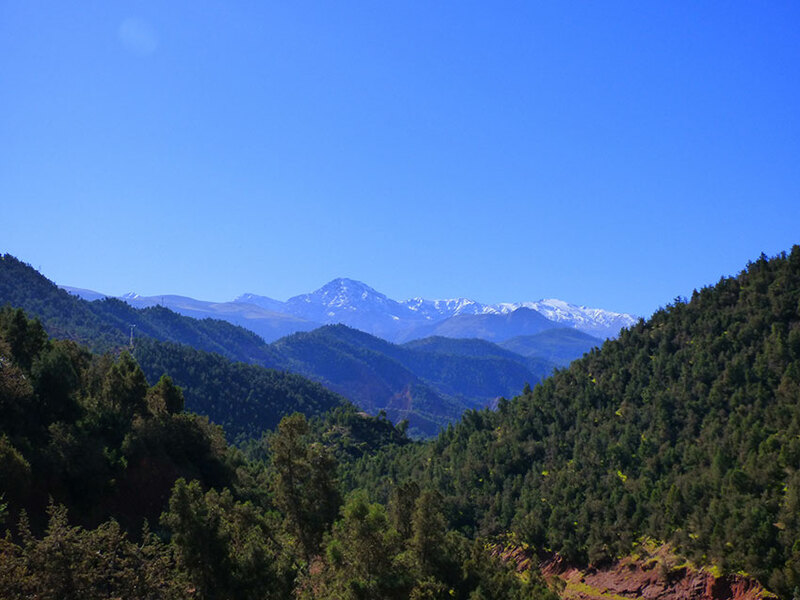 Visiting the Atlas Mountains, I was amazed by the layers of landscape we drove through. The combination of luscious greenery and snowy mountain tops made for picture perfect scenes. We spoke to local people working in the Berber market selling fruits, meats and jewellery, we also watched locals making pottery and one of the BA Ceramics students got to have a go! Exploring the markets on our last day in Morocco. The last full day we spent exploring the market square and souks – they seemed to be never ending! We got to barter with the locals, which was an experience in itself. We had chance to absorb the local way of life, being a part of the hustle and bustle of the streets and buying fabrics and objects to inspire our course projects even further. I have been inspired by my experience in Morocco in so many ways, as it has made me realise how important your senses are when experiencing a place. I am able to appreciate the modern and historical culture of Marrakech, and have gathered lots of primary research material which I will use for many future projects. The memories and objects I made during this trip have influenced me both personally and professionally.